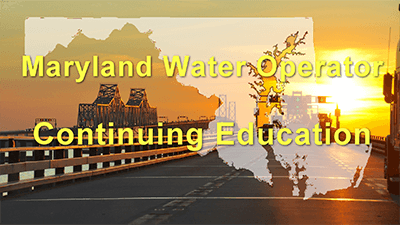 If you are a water operator in the State of Maryland who is looking for continuing education training in order to renew a certificate, you have come to the right place. Here at AYPOTech we offer online courses to help you renew your water operator certificate(s). All courses are approved by the Maryland Department of the Environment. You can find us on the Maryland Board of Waterworks Training Programs list. You'll see that all of our course offerings are approved and ready for you to begin completing your online training today! What are the requirements to renew a Maryland water operator certificate? To renew a Maryland water operator certificate you must complete the required amount of training units for the type of certificate being renewed. This package will cover 5.5 Units in the topics of Distribution and 11.5 Units in the topics of Treatment. On September 15, 2016, the Board of Waterworks and Waste Systems Operators reviewed the training you submitted. As an approved training sponsor you can help certificate holders fulfill their training requirements by providing acceptable proof of training compltetion, such as a certificate of completion, or a training card that has been signed by the instructor or training sponsor to those who complete the training. Please note that each certificate holder is responsible for maintaining records of completed training and submitting this information to the Board as part of his/her application for renewal. Please contact Gregory Wilkinson at (410) 537-3898 or Gregory.Wilksinson@Maryland.gov if you have any questions.